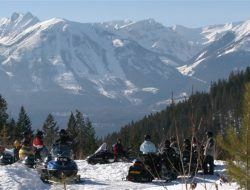 Guided snowmobile tours in the Canadian Rockies are available from Canmore, Banff and Lake Louise. A great way to experience the back-country! You will be shuttled through the majestic Rockies from Canmore, Banff and Lake Louise. Located just west of Yoho National Park, the company we work with is the closest snowmobile operation to Banff (~85 minutes) andLake Louise (~50 minutes.). All the trips provide all the necessary winter gear, a well maintained skidoo, a highly qualified guide, and a memory that will last forever! Want more power? You can upgrade your 380cc Skidoo to a 550cc Skidoo for just a little extra - just ask us for details. We have other tours such as the High Power Private snowmobile tour and for more experienced riders - the Extreme Tour! Please contact us direct for details. The video below is just a snapshot of what to expect on this snowmobile tour. There is no pressure to go fast or slow making this Banff snowmobile tour very family-friendly. Combine with other select Banff Tours for savings!